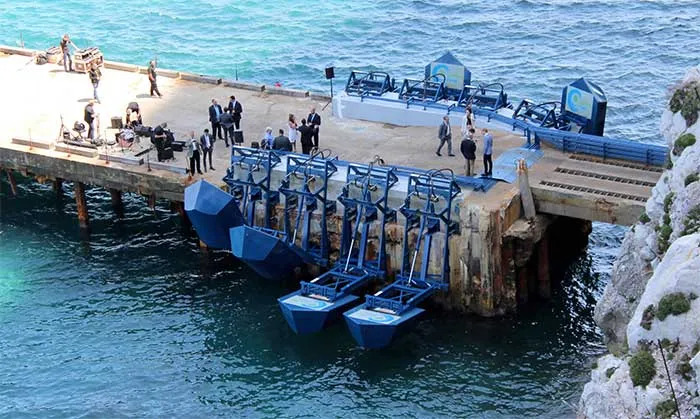 Eco Wave Power generates electricity from ocean waves. The quest for cheap and efficient sources of renewable energy is one of the most pressing challenges in the world today. Much attention has been focused on windmills and solar plants. However, there are numerous challenges affecting the widespread application of the Sun and wind as primary energy sources. Eco Wave Power is hoping to blaze a trail in the world of renewable energy by generating cheap and efficient energy from a less heralded source- ocean waves. The World Energy Council estimates that about 2 million megawatts of electricity (double the current world electricity production) can be generated from ocean waves. Yet, the bulk of this potential remains untapped. Founded in 2011, Eco Wave Power is one of the foremost companies to bring the idea of generating electricity from ocean waves to fruition. Their first major breakthrough was recorded in Gibraltar in 2015 when they were able to construct a power plant that generates electricity out of sea waves and integrate it with the country’s electricity grid. The 100-kilowatt generating power grid is currently being upgraded. The set target for the plant is 5 megawatts. What makes ocean waves better? The most obvious case for harnessing ocean waves for electricity production over wind and solar energy is the constant nature of ocean waves. Wind and Solar power are intermittent and this makes it somewhat difficult to generate a constant stream of energy from them. Electricity can be produced from ocean waves both day and night, all year round. The technology employed by Eco Wave Power only requires waves at an average height of 500 cm, a condition that happens in most oceans, most of the time. Eco Wave Power is certainly not the first company to make an attempt to generate electricity out of sea waves. A good number of companies that have made the attempt have focused on constructing offshore power grids. After carefully observing the demerits of this approach, the company decided the best option would be to set up low-cost onshore stations. While such stations produce less electricity, the simple working principle and cheap running cost make them more economical. Eco Wave Power floats can be attached to common man-made ocean structures such as poles, jetties or piers. The floats come with buoys that move up and down, following the rhythmic movement of ocean waves. This movement creates the pressure that is converted into electricity via a generator. The unpredictability of ocean currents is one of the obstacles towards setting up electricity generating plants on the ocean. When waves get too strong, the power grids could easily get destroyed. To tackle this, Eco Wave Power successfully incorporated a storm protection mechanism into their system. This mechanism serves to lock the power-generating buoys and attach them to the dock to protect them from potentially damaging waves. The predictions about wave power could not be more encouraging and there is no doubt that companies like Eco Wave Power would be at the forefront of the anticipated growth. Current projections show that we could be generating about 750GW of wave and tidal energy come 2050. To encourage scaling and widespread acceptance, however, certain regulatory and bureaucratic obstacles need to be scaled. Top on the list is the absence of a tariff for electricity generated from sea waves. Without a tariff, prospective investors would be unable to build generating stations.